In 1752, Smeaton began working on various experiments with models in relation to the power of water and wind to turn mill wheels. Seven years later he published his findings through the Royal Society, of which he was a Fellow, earning himself the Society's Copley Medal for his efforts. 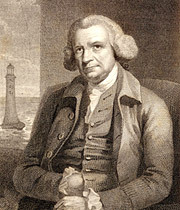 Smeaton then decided to translate his ideas and discoveries into designs for operational millworks. In 1753, he designed windmills at Nine Elms and Barking, and a watermill for grinding flour at Halton, Lancashire. In all, he designed some 49 watermills, another six watermills with returning engines, six windmills and two horse-powered mills. However, he never presumed to be a millwright, or constructor of mills and machinery by trade. Instead he used an engineering approach to deriving the most power from the wind or a given quantity of water. His water wheels were mostly of the overshot type, where the water is fed in at the top, which he had demonstrated to be efficient. They were also Vitruvian (after the Roman engineer Vitruvius), with a vertical wheel carried on a horizontal axle. The water feeds in at the wheel's perimeter and the power is taken off through the axle. In a timber water wheel, water can get in between the wheel's radial spokes and rot the axle shaft. To combat this, Smeaton tended to use cast iron axles held by two pairs of perpendicular parallel timber spokes. Smeaton designed mills for a variety of applications and sometimes took part in site surveys but was rarely present during construction. He expected good workmanship though, often specifying a clearance between the water wheel floats and the breastwork of just 6.35mm (one quarter of an inch). Of the six water-powered pumping engines he designed, perhaps the best known are at Stratford in East London (1763), Old London Bridge (1768) and Deptford Waterworks (the Ravensbourne engine, designed 1778-79) where Smeaton and John Holmes  a cousin and childhood friend  were joint proprietors. The largest of these was the undershot wheel installed in the fifth arch of Old London Bridge, where it used the fast flow of the water to develop some 37-45kW (50-60hp). 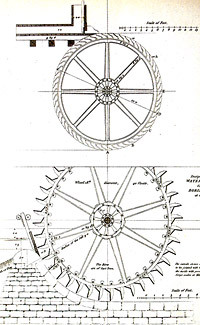 Between 1764 and 1785, Smeaton designed machinery for ironworks. The earliest were for Kilnhurst Forge in Yorkshire (1765). The most comprehensive were for the Carron Company near Falkirk (1769-85), which included dams, furnace blowers, boring mills, tilt hammers, stamps and rolls. Dams were used to improve both the quantity and reliability of the water supply to mill machinery. Smeaton designed six such structures in the 1770s, mostly in connection with his ironworks. The first two were on the River Carron for the Carron Company's Dunipace factory  a horseshoe dam (1772) and a straight dam with sloping stone faces and rubble fill (1773). In 1776, there were two more dams, another rubble one at the Swalwell ironworks in County Durham and, his largest, Coquet Dam for the Coquet ironworks in Northumberland. Coquet Dam is an arched structure with a vertical downstream face. It survives much the same today despite Smeaton remarking, "There is not a more difficult or hazardous piece of work within the compass of civil engineery than the establishment of a high dam upon a rapid river that is liable to great and sudden floods, and such I esteem the river Coquet, and such the dam here proposed". Smeaton's drawings for (top) the waterwheels for Furnace No.2 and (bottom) for the boring mill, both at the Carron Company ironworks on the River Carron near Falkirk. Smeaton designed various works for this site between 1769 and 1785, including dams, furnace blowers, tilt hammers and stamps.